I raise my hat to bloggers who are able to post once a week (or more). Despite my good intentions, I’ve fallen massively behind on even posting on what the SPILLWAY mission was up to 70 years ago. And I’m about to fall even further behind, as this post will barely mention the Special Operations Executive. 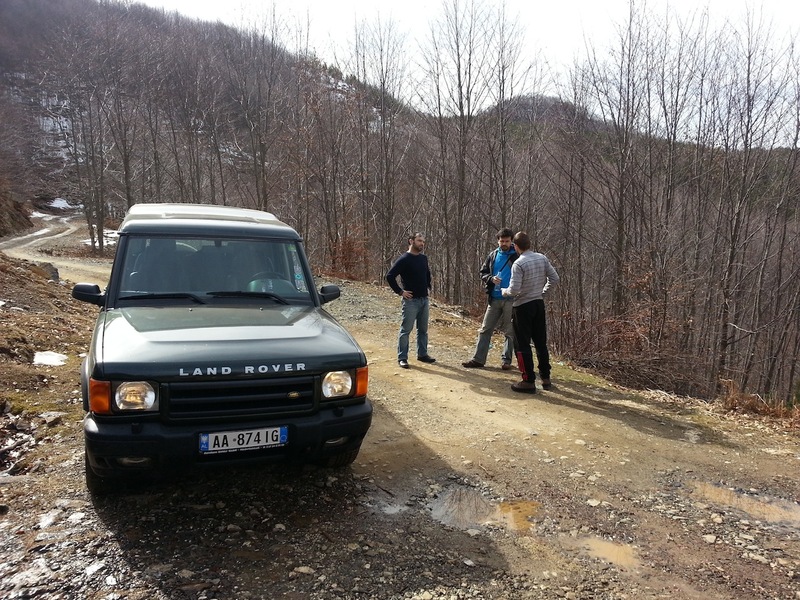 Last week Elton Caushi of Albanian Trip and myself drove into the Shebenik-Jabllanicë national park, to the northeast of Librazhd, in the company of Aleksandër Trajçe of the Association for the Protection & Preservation of the Natural Environment in Albania (PPNEA). 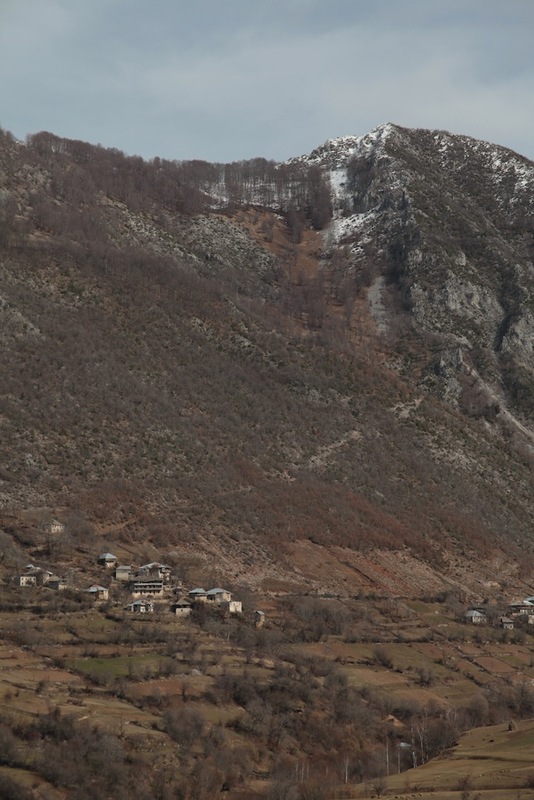 Our target was the village of Qarrishtë, which I unsuccessfully tried to reach last summer on foot from Fushe-Studën, on the other side of a small mountain ridge. 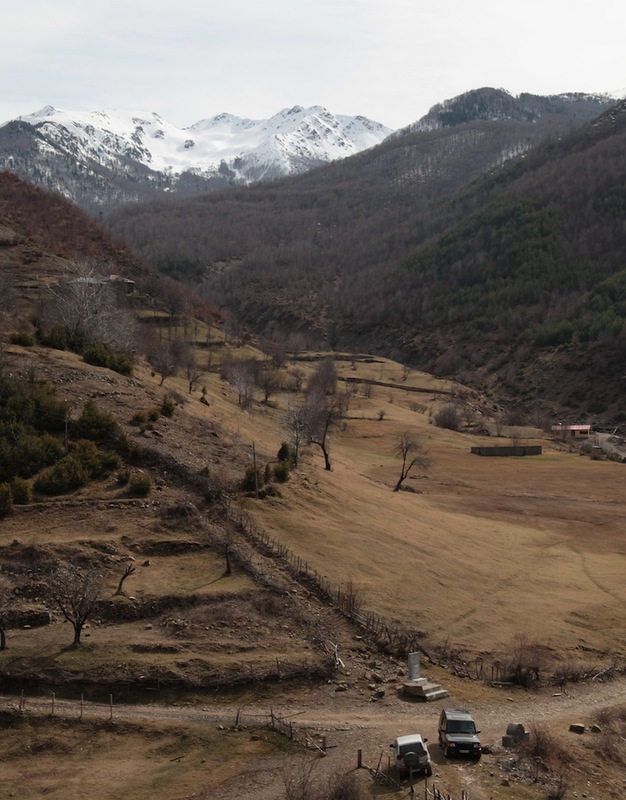 Aleksandër was keen to speak to the farmers in Qarrishtë about the forthcoming two-year hunting moratorium recently announced by the new government here, and also to get a grip on how they were dealing with the bears and wolves that inhabit the forests around the village. 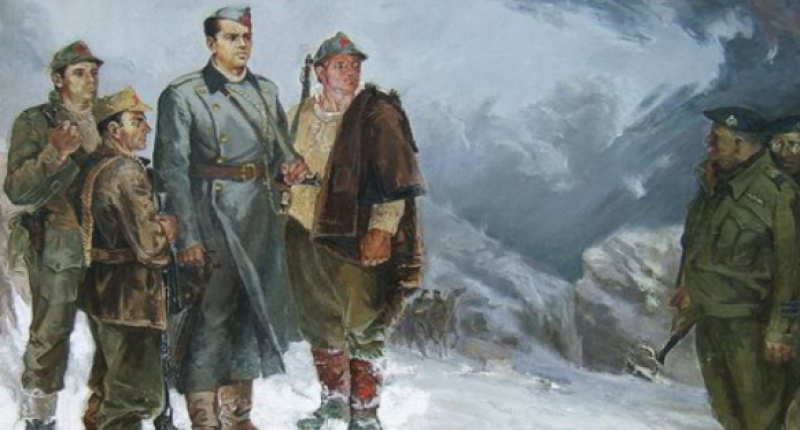 I was keen to see Qarrishtë as Brigadier Trotsky Davies’ SPILLWAY mission almost reached it (they spent a night in freezing conditions on a ridge high above the neighbouring village of Kosharisht, and then had to turn back due to the number of nationalist gangs out looking for them. The most dangerous of these gangs being that led by the local bandit Aziz Biçaku, who was eventually to capture Davies and hand him over to the Germans (he was awarded the Iron Cross, which I think was pinned on him by Himmler). 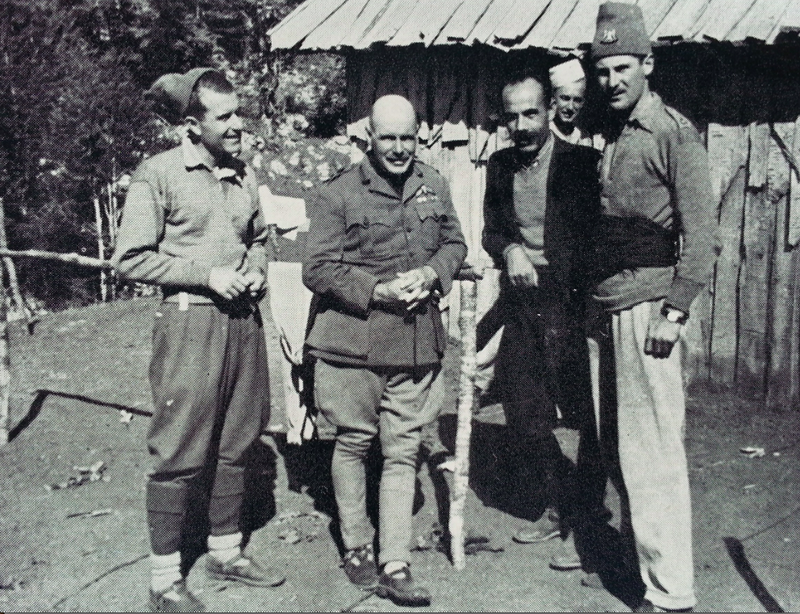 Elton was keen to visit Qarrishtë as during the war the villagers hid nearly 30 Jewish fugitives from the Germans, and he was curious to see if there was any memory of this. We left Librazhd at about 10am, after a hearty breakfast of tasqebab and pilaf at the excellent Restaurant Biçaku, which I’d insisted we eat at purely because of the name. The drive to Qarrishtë from Librazhd takes around two hours, with an awful lot of up and then even more down. Strictly 4×4 only. At this time of year (February) Shebenik-Jabllanicë national park should be under a good few feet of snow, but 2014 is super-naturally mild. Shame, as I’d hoped to see it as the SPILLWAY mission had (though with the protection of 21st-century cold-weather kit). 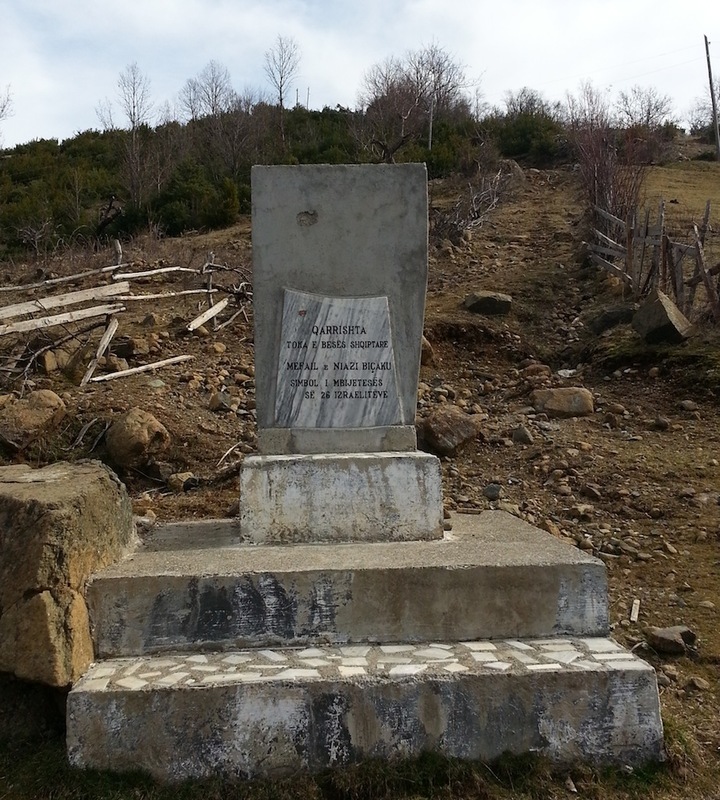 First thing we saw when we arrived a the village were two memorials, one a typically neglected and half-falling-down communist shrine, the second a small concrete job dedicated to Mefail and Njazi Biçaku, for saving 26 ‘Izraelitëve’. We wandered deeper into Qarrishtë, and as is the way when you rock up unannounced in an Albanian village, were almost immediately invited to take coffee with the first family to spot us. This family happened to be a branch of the Biçakus, and were justifiably proud of their relatives’ brave actions during the war. Aziz Biçaku, though, was another matter. 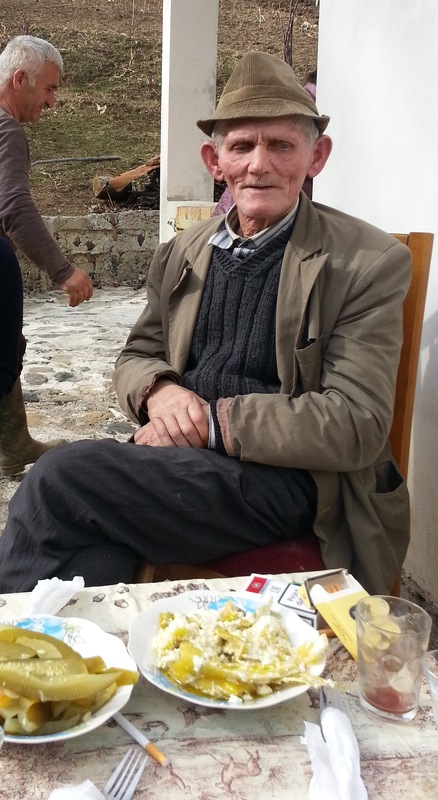 The eldest, Zegir, who must have been 85 if he was a day, remembered Aziz Biçaku well. He had a very distinguished grey moustache, apparently, but was nothing more than a bully and a bandit; the archetype of the Albanian gangster so beloved of Hollywood today. Not a nice man by any account. When the communists came to power he managed to escape to Istanbul, said Zegir, which backs up what I’d been told by the local historian Ferit Balla, who also tells me Davies tried to track Biçaku down himself after the war. As for the 26 Jews, they were hidden in the forest and fed by Mefail and 17-year-old Njazi throughout the winter of 1943/44. This seems to have been standard practise in Albania under German occupation. Not one single Jew was handed over to the Germans – Albania was the only country occupied by the Germans to end the war with more Jews than it had at the start. Curiously, the villainous Aziz Biçaku must have known that his relatives were hiding Jews, yet he never betrayed them to the Germans due to the strong local code of honour. Shooting British officers is one thing, but betraying your neighbours and family is quite beyond the pale. Proving that no good deed goes unpunished, in 1961 the communists imprisoned Mefail for ‘collaborating’ with Jews. He died in prison eight years later. It turns out that a Jewish-American photographer, Norman Gershman, has made a documentary about the experience of Jews in Albania during the war. It’s called BESA: The Promise, and has already picked up several awards at film festivals. You can find out more about it here. Oh, and as for bears and wolves, there are apparently lots of them about. In summertime the bears will come right into the village to raid the beehives and steal fruit. But wolves are the big problem, as they kill more than they need to, and can destroy a flock of sheep if they’re feeling frisky. The bear is a ‘gentleman’, the Biçakus told us, as he’ll only kill one lamb, whereas wolves kill everything they can. 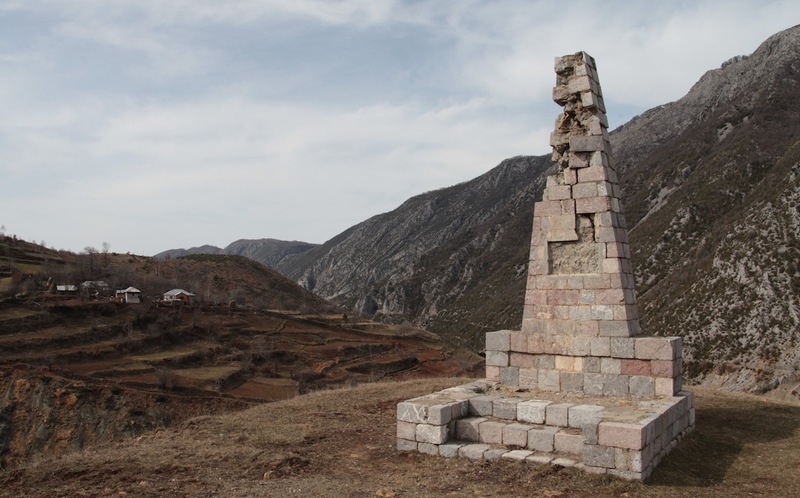 We left Brigadier “Trotsky” Davies and the remnants of his SPILLWAY mission in the village of Kostenje, where he hoped to lie low and give his men time to recover from their forced march over the mountains of the Çermenika massif. My main source both for this blog and for tracing the mission’s route on the ground has been the diary kept, against orders, by Lt Col Arthur Nicholls, which was unearthed by Dr Roderick Bailey when researching his book The Wildest Province: SOE in the Land of the Eagle, and is now held by the Imperial War Museum in London. I thought it would be interesting to throw into the mix a few pages from Enver Hoxha’s somewhat scurrilous memoir, The Anglo-American Threat to Albania (which you can find as a free PDF here; it’s actually quite a good read if you can cope with Hoxha’s verbosity and the repetition of “so-called” every other page). It’s fair to say that Hoxha’s memoir, published in the early 1980s, is unreliable on all sorts of levels. After we had completed all our preparations for the march, through the snow and winter blizzard, I went to the house where the General [Brig Davies] was staying. I sat down. He offered me a cigarette and I talked to him about the plan. He was worried, kept looking at the Colonel [Nicholls] and seemed as if he wanted his permission. «Let the Colonel decide,» he said. The Colonel was sitting on a stool. I said with a laugh, «Whether or not the Colonel likes the idea…» And I reached over to where he was sitting and slapped him on the knee. I could not finish my sentence, because he gave a loud cry followed by a deep groan. «Do you have any possibilities?» he asked me. «Dr. Dishnica must see him in the first place, and then I think we must transfer him as quickly as possible to Tirana. We have our doctors there,» I replied. «But is this possible?» asked the General in astonishment. «We can get him to Tirana within a few days and the operation can be done immediately,» I said. After consulting with Nicholls, the General told me they would be grateful if we could get this underway quickly and expressed the desire that Nicholls should be sheltered in the home of one of their men, a bey of Jella, if I am not mistaken. «Wherever you like,» I replied, and without delay sent couriers urgently to instruct the comrades of Mat and Tirana to organize a refuge for the Colonel and the operation on him as quickly as possible. The General thanked me for our concern and the speed with which we were acting to save the Colonel and said that in these conditions he could not leave the vicinity of Tirana until the Colonel was better. Baba Faja came and met the General. We said goodbye. I shook the General by the hand saying: «I’ll see you again in the zone of Korça,» but we never met again. A number of Ballists and Germans were killed and the firing stopped. The enemy with- drew. After the battle, the partisans discovered that the British General was missing. Exhausted, completely discouraged, he had thrown away his weapons and surrendered without firing a shot.